While the original White River forest-plan alternatives numbered nine, lettered A through I, now there are six. Alternative B: The status quo, which emphasizes production of goods, recreation and grazing. Few restrictions on travel, no new recommendations for wilderness; timber harvest at medium level. Alternative C: Termed "the compromise," this alternative emphasizes a wide range of recreational possibilities, "in balance with biodiversity." Ecological constraints may limit recreation activities in some locations of the forest. No new roads will be built in areas that have not been previously developed. * Travel management plan includes fewer total road miles but more total trail miles. Mechanized travel is restricted to designated routes on much of the forest. There is more separation forest-wide between motorized and non-motorized users in summer, and in high-use areas during winter. * Additional motorized opportunities are provided in summer, and more non-motorized opportunities are provided in winter. Ski-based resort land allocations increase, as well as opportunities for additional backcountry huts. * Some areas are recommended for designated wilderness. Alternative D: The Forest Service's preferred alternative. * Stresses biologically and physically sustainable ecosystems, maintenance of habitat and watershed health and improvement. * The alternative "represents an aggressive approach to habitat management (including timber harvesting and prescribed fire) and places low emphasis on letting natural processes run their course" thus engendering "the most rapid progress ... toward a diverse, healthy ecosystem condition ... Places a low emphasis on developments for human uses or recreation." * Little or no off-road motorized or mechanized travel is allowed. Summer motorized travel is reduced and concentrated, with fewer open roads, fewer total road miles. Winter motorized travel restricted to designated trails in critical wildlife habitat areas, and total acres open to motored use will be reduced. * Ski-based resort land allocations reduced to current permit boundaries; opportunities for aerial transportation corridors do not exist. Few, if any, opportunities for additional backcountry huts. * Timber harvest is "oriented to forest health and wildlife habitat purposes." Alternative E: Provides economic benefits to local communities - ski resort development, for example. Alternative F: Commodities-based. Emphasizes more timbering and grazing opportunities. Alternative I: Based on conservation biology and views expressed by the Aspen Wilderness Workshop. * Lets Mother Nature play a more active role. Habitat improvements focused on threatened and endangered species. * Fewest motorized and mechanized routes among alternatives, both summer and winter. Greatest reduction in roads and miles. * Ski resort land allocations reduced to current permit boundaries. Opportunities for aerial transportation corridors do not exist; opportunities for additional backcountry huts, developed sites, few if any. 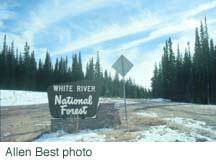 * Low-level timber harvest; the alternative with the most roadless areas recommended for wilderness designation.